In this episode I’m talking with Debbie Steinberg Kuntz, the woman behind Positive Impact Family coaching and therapy practice and the Bright & Quirky Child Online Summit. Debbie is a licensed marriage and family therapist, parent coach, speaker, whose passion is bringing the latest information to parents raising differently wired kids, who may struggle with symptoms of ADHD, high functioning autism, learning challenges, anxiety, or oppositional defiant disorder. 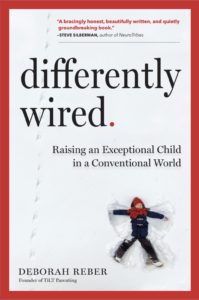 Today, Debbie is going to walk us through a 6-step strategy that parents can employ to help their child thrive that fits the unique way they are wired. We’ll also talk about the most common challenges facing parents like us and how to help our kids who might be more rigid thinkers develop more flexibility. Lastly, Debbie’s free Bright & Quirky Child Online Summit begins next week (January 28th), so if you want to check that out, just click here. About Debbie: Debbie Steinberg Kuntz, LMFT is a licensed marriage and family therapist, parent coach, speaker, and co-chair of parent education for the Issaquah School District in WA State. She’s been in private practice for almost a decade and specializes in bright and quirky kids whose parents often work in Seattle’s high tech industry. She runs the Bright and Quirky Child Online Summit and loves bringing the latest information to parents raising differently wired kids, who may struggle with symptoms of ADHD, high functioning autism, learning challenges, anxiety, or oppositional defiant disorder. Debbie’s work is based on the idea that empowering parents and kids with positive mindsets, tools and strategies creates a powerful positive ripple effect in the world and in future generations. Every family can become a positive impact family. Debbie earned a B.A. from Middlebury College and a Masters in Child, Couple and Family Counseling from Antioch University. She lives in WA with her husband of twenty years and two sons, ages 16 and 13.